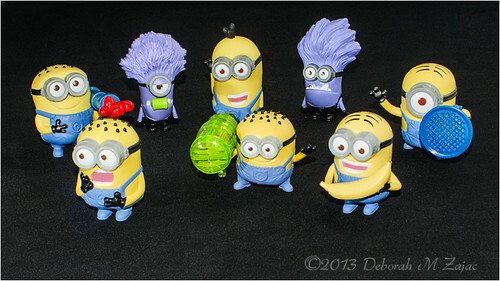 Despicable Me 2 Minions, originally uploaded by CircadianReflections Photography. It took 2 weeks, but I collected the entire set of McDonald’s Happy Meal Minions. I’m getting a little better getting my Speedlight positioned so the black background stays black. This only required a few spot healing passes to clean up lint. Yeah! I used my kitchen table for a larger work surface and placed the toys further away from the background, and bounced the light off the ceiling and a white foam core bd which I had placed on the right side of the set. Great studio shot! At first I thought it was a professionally rendered graphic. Thank you Geo! That’s quite a compliment!! Next Next post: If I had a Hammer!